Home ♦ Coffee ♦ What is an affogato? An affogato is a traditional Italian espresso-based treat that you’ll find on the menu at many Italian restaurants, as well as at many cafes serving espresso and other coffee drinks. The full name is really “affogato al cafe” or “drowned in coffee,” in Italian. The name really suits the dessert, as it consists of a scoop of ice cream/gelato with a shot of hot espresso poured over the top. The basic recipe is subject to an almost infinite number of variations – using different coffee drinks, different ice cream flavors and different ratios of the two items. 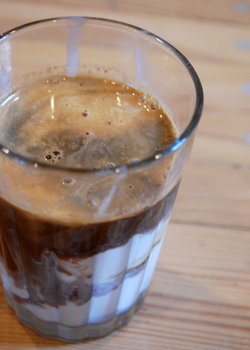 Other desserts/drinks can also be made “Affogato-style,” which means that they have a shot of espresso poured over the top. Starbucks made the name fairly common by offering affogato-style frappuccinos, with the option to add a shot poured over the top of the milkshake-like drink. You can make it at home with your favorite coffee, just brew it extra strong so you only need to pour a small amount over the ice cream. Start with vanilla, as it really suits the coffee, but feel free to experiment with chocolate or coffee-flavored ice cream, as well!